Sox9-creERT2+ cells label early cells of the osteoblast lineage in postnatal mice in vivo. (A and B) Representative long bone section from Sox9-creERT2; R26RTomato; Ocn-GFPtpz mice at 4 days (A) and 27 days (B) after tamoxifen injection. 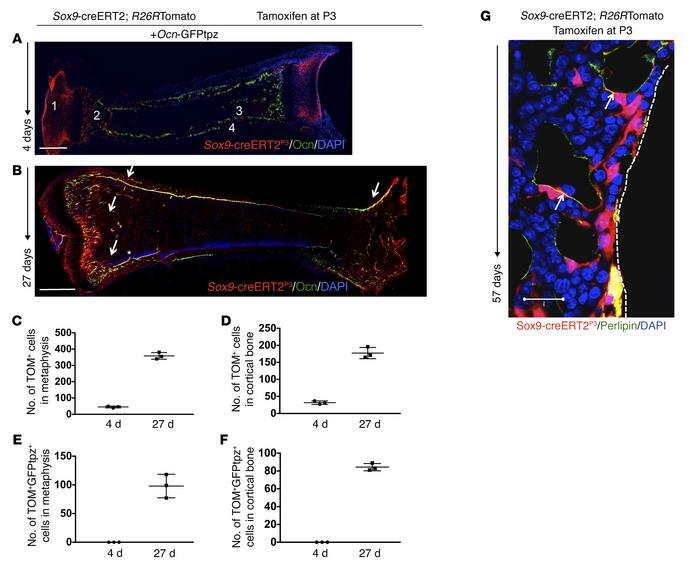 Sox9-creERT2; R26RTomato cells at P7 were seen as articular chondrocytes (no. 1), in the metaphysis (no. 2), and at endocortical (no. 3) and periosteal (no. 4) surfaces and did not overlap with Ocn-GFPtpz. At P30, several Sox9-creERT2; R26RTomato cells coincided with Ocn-GFPtpz cells in the metaphysis and at endocortical and periosteal surfaces, shown as yellow cells (arrows). Scale bars: 0.5 mm. (C and D) The number of Sox9-creERT2; R26RTdTomato+ (TOM+) cells counted in the metaphysis and cortical diaphyseal bone in standard regions described in Supplemental Figure 11 on day 4 and day 27 after tamoxifen injection. (E and F) The number of Sox9-creERT2; R26RTomato+ (TOM+GFPtpz+) cells that also colocalized Ocn-GFPtpz protein in the metaphysis and cortical bone in diaphysis counted on day 4 and day 27 after tamoxifen injection. Data represent mean ± SD from 3 independent experiments with 3 mice/experiment. (G) Representative confocal image of Sox9-creERT2; R26RTdTomato+ and perilipin-positive adipocytes (arrows) in the distal tibia after 57 days of tamoxifen administration. Data represent 3 independent experiments with 3 mice/experiment.